White Lea Farm is a 91 acre hill farm set in the remote and beautiful countryside of the Staffordshire Moorlands within the Peak District National Park. The nearest village is Onecote which is just over a mile away whilst the nearest town is the pretty market town of Leek. 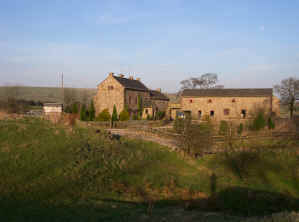 The farm was previously a dairy farm. The current owners produced beef from a suckler herd of pedigree limousin bull and mixed beefbreed cross fresian cows. More recently the farm has moved over to sheep production and horse grazing. The main farm house and buildings are grouped together in the middle of the land and are approached by a private drive of about 1/3 mile. The land is a mix of pasture , meadows and permanent grassland which falls gradually from 1200 feet down to the river hamps. The farm is within the South west peak environmentally sensitive area.